So... I create a quick button, "FIND US ON ebay", and replaced that corner from that RSS peeling thing to an ebay button. My default button is really large so I added some CSS and also changed the code in the functions.php file because it is not otherwise possible to edit that picture. Replace <your-site> with the correct name, you may also have your site in a completely different location. This is the default on an Ubuntu computer. Now you have two solutions to fix theproblem. You can change the image named page_peel.png or you can change the code. I decided to change the code and point to my new images I simply uploaded in the Media library. By default the peel scrolls up and down with the page. I made my button "fixed" so it stays on the screen at all time. I also added a border around the button and a nice shadow. Obviously this supposes that you turned on the Page Peel flag in the U-Design settings. There is a screnshot showing that option. Note that the U-Design settings are in your left sidebar, scroll down until you see it. It is not part of the theme appearance. Make sure to click Save after you made a change to the U-Design settings. It is not automatic. Finally, your pages will look correct while you are logged in, but for an anonymous user, it is not unlikely to still look wrong, at least on some pages. To fix that problem, you want to reset the cache. Since you cannot be sure whether one of your pages is afflicted by this, you want to clear all pages. 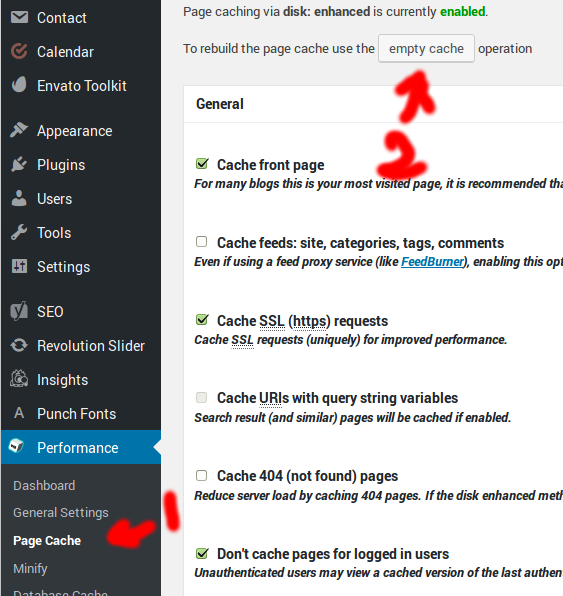 To do this in Wordpress in 2017, hover over Performance (left side bar) and then click on Page Cache. The following appears and you want to click on the empty cache button near the top. That will clear the cache of all pages and make sure your users see your changes as expected.